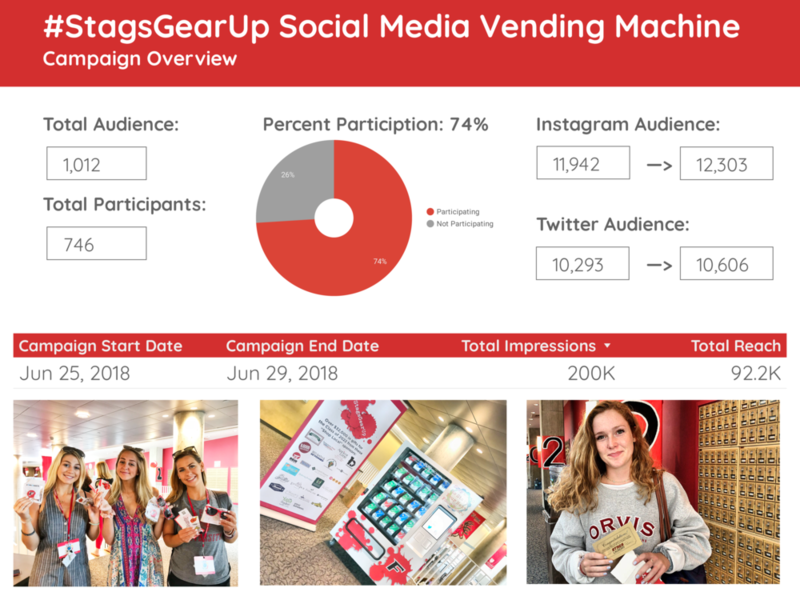 The #StagsGearUp campaign was an innovative and award-winning User Generated Content (UGC) campaign for Fairfield University. Check out this video, which gives the brief overview of this excellent addition to Fairfield’s New Student Orientation event. Then, read below for details on how I lead the charge to bring this project—now a Finalist for Best Use of Technology at the 2019 PR News Social Media Awards—to life. Research has already proven that Fairfield University contributes approximately $1billion to the local Fairfield, CT economy every year through business by students and others in the campus community. New, students, however, may not know all the options for retail, dining, and recreation just five minutes from their dorm rooms. Therefore, I pointed out a great opportunity: Why not use New Student Orientation, the four days when over 1,000 undergraduates become acquainted with life in Stag Country, to build relationship with the local business community while expanding Fairfield’s reach, brand awareness, and following on social media with user generated content (UGC)? The #StagsGearUp campaign was born. To make #StagsGearUp a reality, I procured a social media vending machine by the Innovative Vending Solutions company, and worked with IVS to customize it for Fairfield’s event. In-house, I worked with Fairfield’s Design and Print department the campaign’s look, including a custom wrapper for the vending machine, package designs, and digital and physical signage placed throughout campus. I also worked with Fairfield’s director of University sponsorships, and with her help filled the social vending machine with over $32,000 in gifts for new students from local businesses. During the June 2018 week of New Student Orientation events, I worked with a team of interns to promote the machine, teach new students how to interact with the machine using Twitter and Instagram, restock the machine as necessary, and capture photo, video, Snapchat, and Instagram coverage of the campaign. After 4 days, the analytics for the #StagsGearUp campaign spoke for themselves.